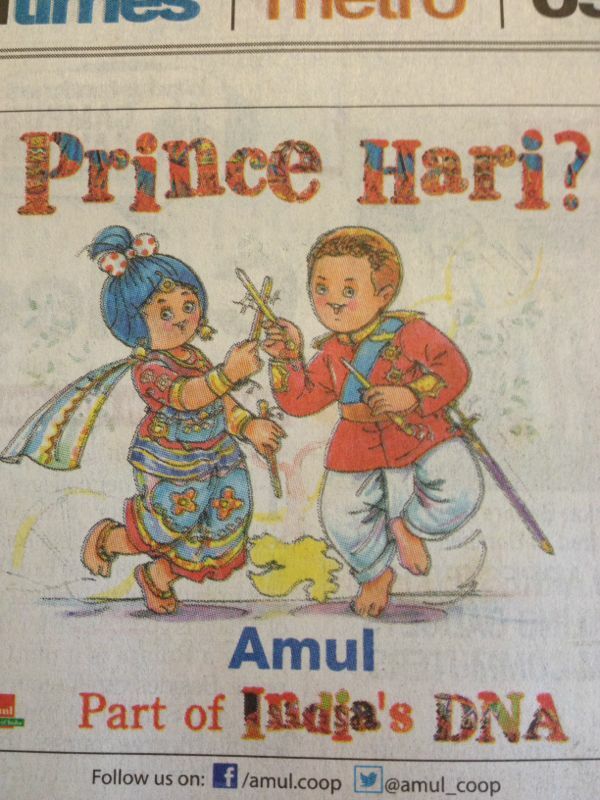 Prince Harry is Indian and so am I ! I am sure most of you will have read recent news reports that Prince William and Prince Harry have some Indian ancestry due to a relative’s dalliance with their Gujarati House-Keeper a few generations ago. Looking at them one would never guess, the Indian genes obviously having been diluted over the years. But the interesting thing is that I also have some Indian ancestry and in a much closer generation however no one would guess to look at me with my lustrous brown hair and my radiant alabaster complexion. What makes it even more interesting is that my ancestry stems from Kerala, a state where people aren’t exactly known for their fairness of skin. Back in the 1940’s while the British still occupied India, my paternal grandfather was stationed in Bangalore with an Army Regiment called The Madras Sappers. The Madras Sappers are still based in Bangalore today with their head-quarters situated in the centre of Bangalore beside the Ulsoor Lake. Back then my grandfather, a young Sergeant Major, met a beautiful young nurse, fell in love, wooed her, married her, and my father was born. Not long afterwards before England relinquished their control on India, they left for England never to return to India again. My grandmother’s background was never really spoken about, and it was only when I moved to England in my late teens and spent time with her that her story came out. My Grandmother was actually Anglo-Indian which explained her different accent and her lovely olive skin. Her family hailed from Cochin in Kerala, and in fact one of her relatives was the first ever Superintendent of Police of Cochin State when the Police Department was formed in 1883. In the days when she met my Grandfather and fell in love it was not considered “the done thing” for the English to fraternize with the locals and I think sadly, that this was the reason why Grandmother had always kept her background hidden. One of my uncles on an earlier trip to India had found the graves of some of her family in Cochin and we have since tracked down some surviving relatives who are now located in Lucknow, but I regret that I did not make more of an effort to delve deeper into her history and find out more about a side of our family unspoken about for so long. When I came to Bangalore I used to call her up back in England, and she used to reminisce about her time in Bangalore and talk about the places she used to visit with my Grandfather. She had such fond memories and I never had the heart to tell her that most of those places no longer existed and the Bangalore she knew had transformed beyond her wildest imagination. She never had the chance to revisit India, and passed away in England. Over 60 years after she left the country of her birth, a part of her returned, when a portion of her ashes was sent to me here in Bangalore and I scattered them under a beautiful, parrot filled, Peepal Tree in Cubbon Park. What is quite fascinating is that I too fell in love with an Indian woman, albeit while living in Hong Kong and events conspired to bring us both to Bangalore, the city where my Grandparents met and fell in love. And in yet another coincidence, my wife’s uncle also served in The Madras Sappers! It’s amazing how life can bring you in a full circle! This entry was posted in Bangalore, India, Karnataka, Life and tagged Anglo-Indian, Bangalore, Cochin, Cubbon Park, England, Grandparent, India, Kerala, Madras Sappers, Prince Harry of Wales, Prince William by Kiwigypsy. Bookmark the permalink. I am glad you thought so. I was getting tears in my eyes when I wrote it and thought I was just getting senti in my old age!